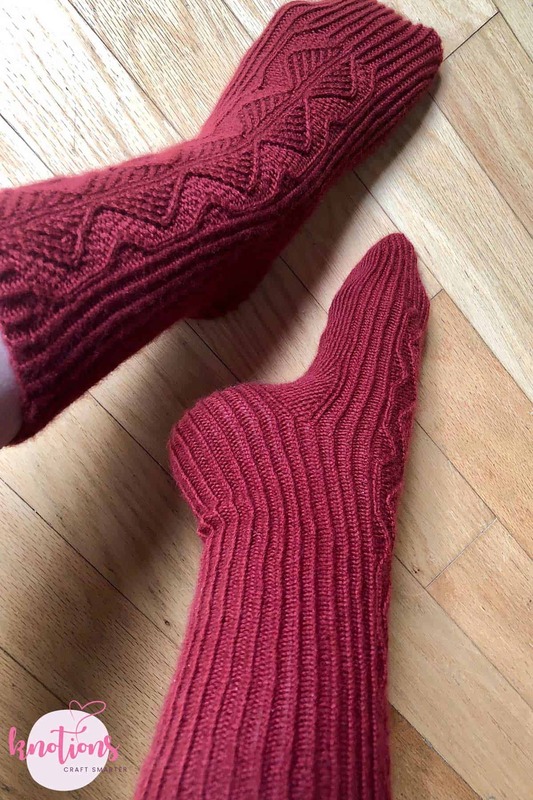 These unisex socks are super cozy and stretchy. 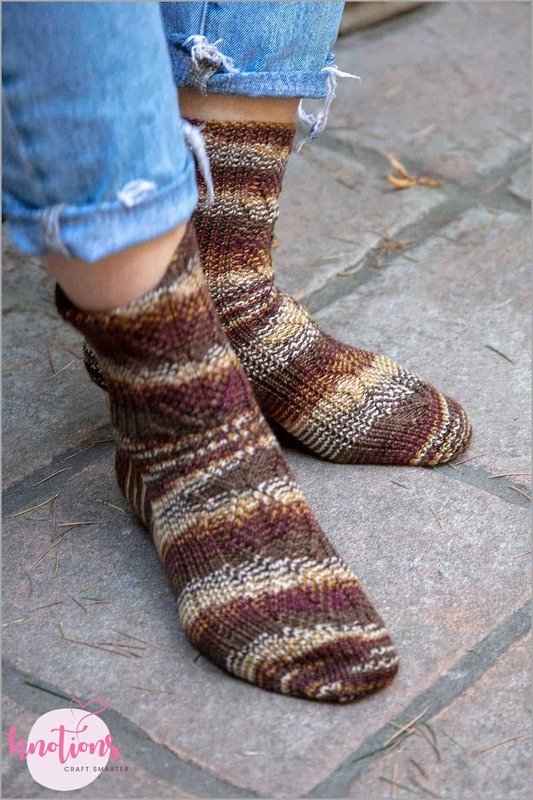 The easy wearability and the forgiving nature of the ribbing, which is an integral element of the design, make picking the right size for gifting less of an issue. 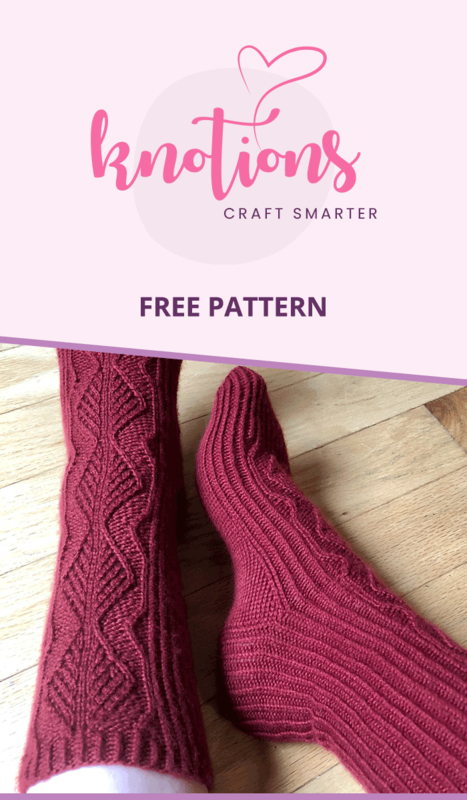 If you keep them for yourself, you will pull these casual, sturdy socks out of the drawer time and time again, because they just feel so good on your feet. Sized xs to xxl. Thank you to Elizabeth Alonso for allowing us to use her pics (the ones in the dark red). 32 sts and 48 rows = 4” [10 cm] in St st.
32 sts and 48 rows = 4” [10 cm] in 1×1 ribbing, slightly stretched. RT (right twist): K2tog without slipping off the LH needle, insert working needle into 1st st and knit it as normal, dropping off LH needle. LT (left twist): Slip 2 sts knitwise one at a time to RH needle, then sl them purlwise back to LH needle. Knit 2nd st on LH needle tbl, k2tog tbl. Because of the huge amount of stretch in these, if in doubt, when choosing between two sizes, go to the smaller size. When adjusting pattern for length, note that Diamond Panel measures 2” or 2.5 cm. Diamond stitch panel is worked over center 19 stitches on instep with ribbing on either side of panel and over back of leg. Written directions at the bottom. CO 50 (58, 66, 74, 82, 90) sts using long-tail or equally stretchy cast on and join to work in the round. Work in k1p1 ribbing for 6 rnds. (.5” [1 cm]). Work 3 (5, 7, 9, 11, 13) sts in ribbing as established, pm, work Diamond stitch panel over 19 stitches, pm, work 3 (5, 7, 9, 11, 13) instep sts in established ribbing and continue in ribbing over heel sts to end of rnd. Continue working in established patterns, slipping markers as you come to them until Diamond Stitch Panel has been completed 2 times. Turn work so that WS is facing, and begin working in rows over 25 (29, 33, 37, 41, 45) heel sts only. Row 1 (WS): Sl 1 pwise wyb, rib to last st, k1, turn. Row 2 (RS): Sl 1 pwise wyf, rib to last st, p1, turn. Work these two rows 11 (13, 15, 17, 19, 21) more times, then work 1 more WS row, ending ready to work a RS row; 25 (29, 33, 37, 41, 45) total heel rows worked. Row 1 (RS): Sl 1, k13 (15, 17, 19, 21, 23), ssk, k1, turn. Row 2 (WS): Sl 1, p4, p2tog, p1, turn. Row 3 (RS): Sl 1, k to 1 st before gap, ssk over gap, k1, turn. Row 4 (WS): Sl 1, p to 1 st before gap, p2tog over gap, p1, turn. Rep Rows 3 and 4 until all sts have been used up; 15 (17, 19, 21, 23, 25) sts remain. 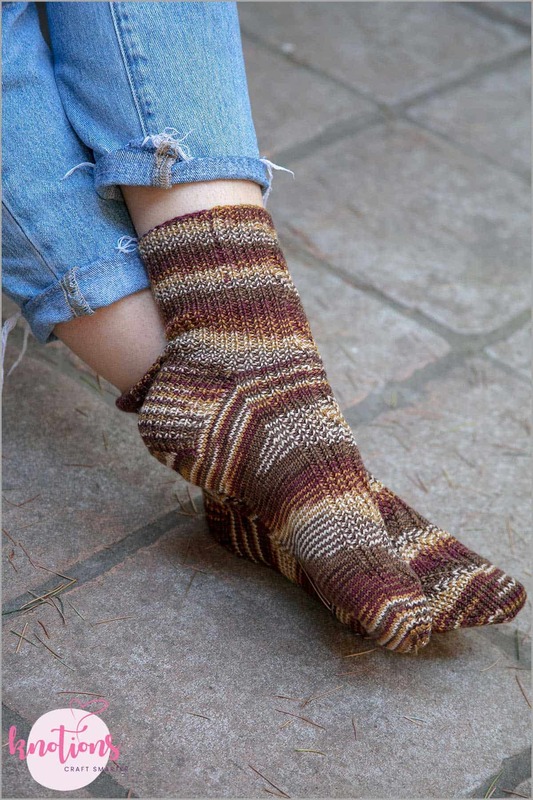 The stitches to be picked up at either side of the heel flap resemble elongated vees. After the set-up is complete, the beginning of round will have been moved to center back of heel. Set Up: K across all sts of heel proper and begin picking up heel flap sts as follows: pick up 1 st at gap, then pick up 12 (14, 16, 18, 20, 22) sts of flap and 1 more st at gap (14 (16, 18, 20, 22, 24) stitches picked up). 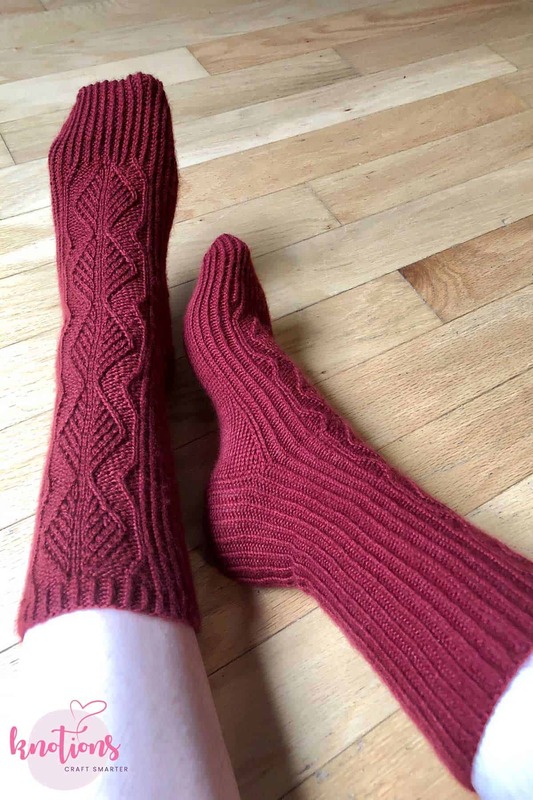 On instep, rib 3 (5, 7, 9, 11, 13) sts as established, work row 1 of Diamond Stitch, rib 3 (5, 7, 9, 11, 13) sts; pick up 1 st at gap, then pick up 12 (14, 16, 18, 20, 22) sts of flap and 1 more st at gap, 14 (16, 18, 22, 24) stitches picked up), then continue knitting across 7 (8, 9, 10, 11, 12) sts. The next stitch is the center back of heel and the new beginning of rnd; mark this stitch if desired with safety pin or locking stitch marker. 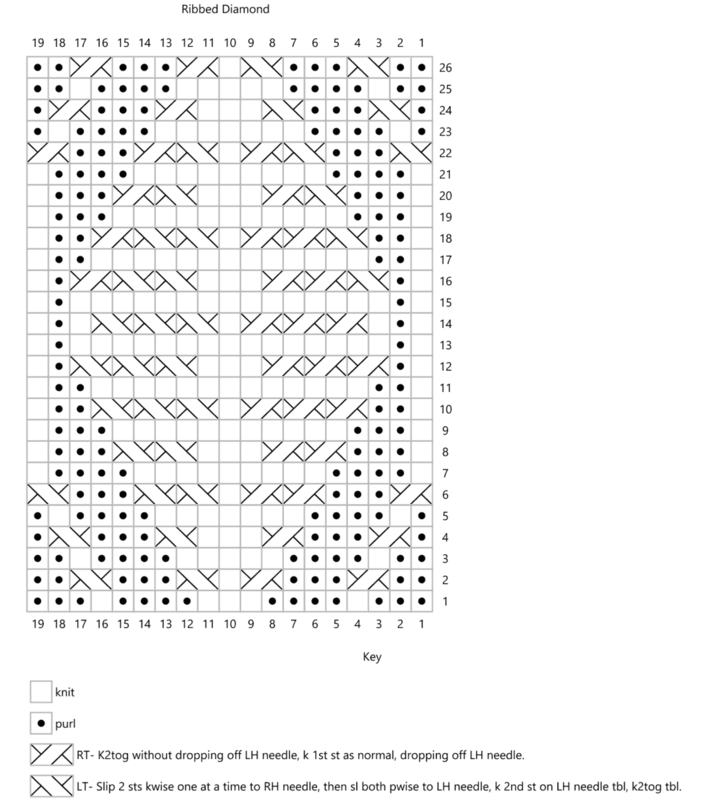 Rnd 1: K to 3 sts before instep, k2tog, k1, work all instep stitches in pattern as established, k1, ssk, k to end of rnd. Rnd 2: K to instep, work instep as established, k to end of rnd. Repeat Rnds 1 and 2 until 50 (58, 66, 74, 82, 90) sts remain. Work even as established until Diamond panel has been completed 2 (2, 3, 3, 4, 4) more times; 4 (4, 5, 5, 6, 6) times total (including cuff). Rnd 1: K to instep, rib across all 25 (29, 33, 37, 41, 45) instep sts, k to end of rnd. Work in k1p1 ribbing over instep sts only until sock is approx. 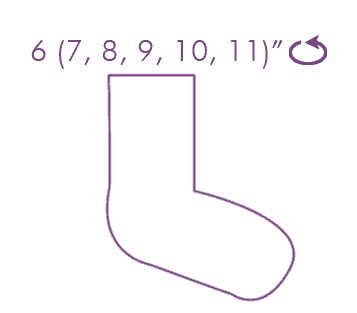 1.25 (1.5, 1.5, 2, 2, 2)” [3 (4, 4,5, 5, 5) cm] shorter than desired finished foot length. Rnd 2: Work even as established, working ribbing over top of toe and stockinette over sole. Repeat Rnds 1 and 2 5 more times. Then work Rnd 1 only to desired finished length, trying on sock if possible for fit and working an extra rnd or two without decreases as needed. Knit across remaining sole sts to prepare for grafting. Graft toe sts. 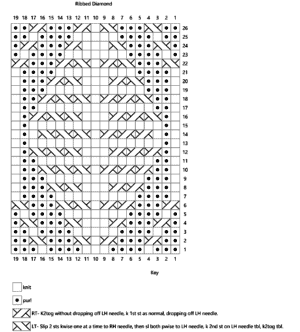 Weave in ends, block and enjoy! Rnd 1: P3, k1, p4, k3, p4, k1, p3. Rnd 2: P2, RT, p3, RT, k1, LT, p3, LT, p2. Rnd 3: P2, k1, p4, k5, p4, k1, p2. Rnd 4: P1, RT, p3, RT, k3, LT, p3, LT, p1. Rnd 5: P1, k1 p4, k7, p4, k1, p1. Rnd 6: RT, p3, RT x 2, k1, LT x 2, p3, LT.
Rnd 7: K1, p4, k9, p4, k1. Rnd 8: K1, p3, RT x 2, k3, LT x 2, p3, k1. Rnd 9: K1, p3, k11, p3, k1. Rnd 10: K1, p2, RT x 3, k1, LT x 3, p2, k1. Rnd 11: K1, p2, k13, p2, k1. Rnd 12: K1, p1, RT x 3, k3, LT x 3, p1 k1. Rnd 13: K1, p1 k15, p1, k1. Rnd 14: K1, p1, k1, RT x 3, k1, LT x 3, k1, p1, k1. Rnd 15: K1, p1, k15, p1, k1. Rnd 16: K1, p1, LT, RT x 2, k3, LT x 2, RT, p1, k1. Rnd 17: K1, p2, k13, p2, k1. Rnd 18: K1, p2, LT, RT x 2, k1, LT x 2, RT, p2, k1. Rnd 19: K1, p3, k11, p3, k1. Rnd 20: K1, p3, LT, RT, k3, LT, RT, p3, k1. Rnd 21: K1, p4, k9, p4, k1. Rnd 22: LT, p3, LT, RT, k1, LT, RT, p3, RT. Rnd 23: P1, k1, p4, k7, p4, k1, p1. Rnd 24: P1, LT, p3, LT, k3, RT, p3, RT, p1. Rnd 25: P2, k1, p4, k5, p4, k1, p2. Rnd 26: P2, LT, p3, LT, k1, RT, p3, RT, p2. Deborah has been knitting since 2004. 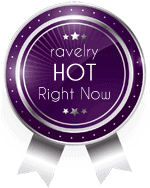 She teaches knitting locally and loves to share the craft with others. She enjoys designing textural items that work up quickly. She has a grown daughter who has, in recent months, become a slightly reluctant knitwear model and a husband of 20 years who has become a somewhat hesitant knitwear photographer. She is probably on her couch right now, buried under yarn and stitch dictionaries. She is having her husband rewind the movie they are watching because she didn’t see that thing that just happened. Please feel free to contact her with any questions or just to say hello.